Are you looking for ways to motivate your students to be more engaged in their reading and want to improve their writing? Blogging may provide just the inspiration they need to share their thoughts, writing for an authentic audience, not just the teacher. What would your students say if they could speak to the world? Digital tools have given every one of my 5th grade students a voice and have helped to create an incredible community that extends far beyond the four walls of my classroom. All of my students from the most eager, to the most reluctant, and even a student with selective mutism who we would otherwise not hear from have found their voice and a place to connect and encourage one another in growing as learners. Blogging has given my students an authentic audience and the opportunity to express themselves along with the ability to take ownership of their learning as they share their thoughts and ideas about their reading, their learning and their needs. ​It has provided opportunities to improve communication, the writing process, establishing and maintaining connections, as well as the importance of internet safety. 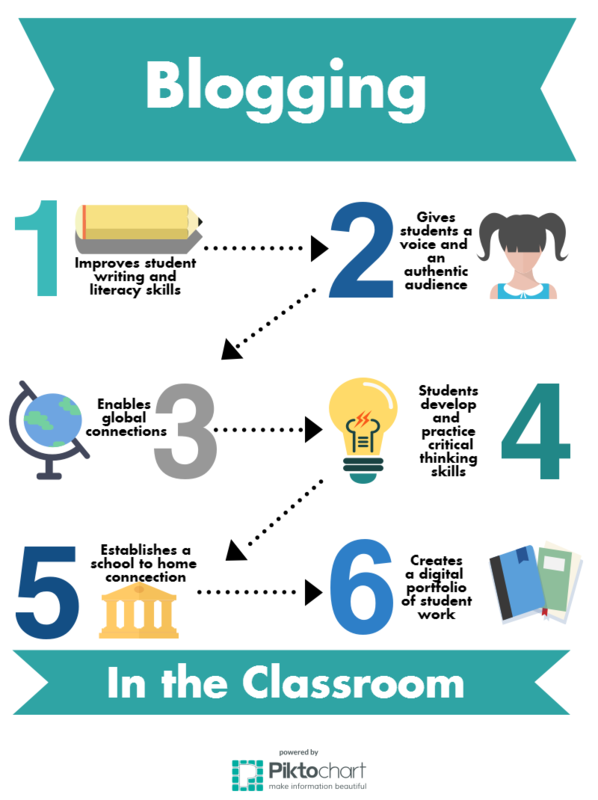 I created the infographic above illustrating the benefits of blogging, using Piktochart, a free site to create infographs.